Buy and earn 81 points valued at £0.81. 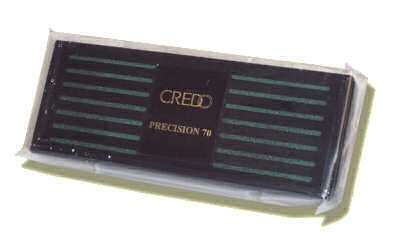 Credo Humidifier Onyx - Size 16.5 x 6.5 x 2cm , 70% humidity guaranteed for a humidor containing 50 to 100 cigars. The Credo self- regulated humidification system is based on a physico-chemical process whose molecular mechanisms allow a rigorous water evaporation control The principle is based on the creation of melange of water and tensio-active substances which limits the potential of the evaporation of the water itself. It Works! humidity is tamed and the amateur is carefree. All CREDO humidifiers are delivered ready for use and need only to have distilled water added following the directions. The periodic addition of distilled water is enough to enable it to stabilize the Relative Humidity. Under normal conditions of use, your CREDO should be refilled with distilled water approximately every month. A hygrometer will allow you to estimate if a refill is necessary or not. This is required when any deviation below 68% occurs.